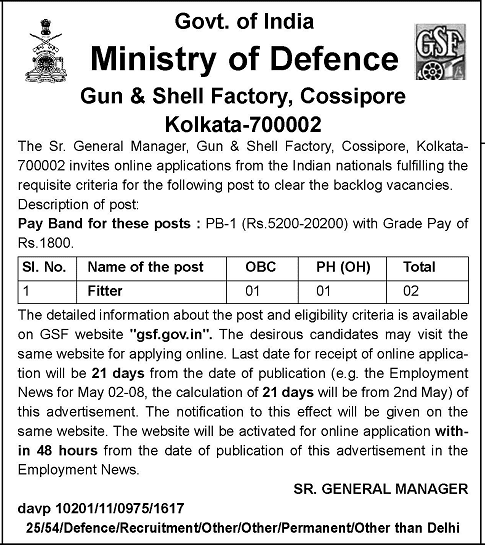 Gun and Shell Factory i.e GSF, Cossipore Kolkata, invites online applications recruit for 02 Vacancies of Fitter Posts. The closing date for receipt of online application is 07/10/2016. The Govt. of India, Ministry of Defense,Gun and Shell Factory, Cossipore Kolkata-700002. Industrial Training Institute (ITI) in Fitter Trade recognized by NCVT. The eligible candidates may visit GSP official website for apply online registration.The closing date for submission of online application will be 21 days from the date of publication of this advertisement in Employment News Paper of 17 - 23 September 2016 i.e. Last date will be 07/10/2016. The GSF website online registration will be activated for online application within 48 hours from the date of publication in the Employment News.